Jay and Sarah were the first travelers to participate in this plan! We discussed where to meet over e-mail, and met at an exit of Monzen Nakacho Station. You can reach to Monzen Nakacho Station either by Tokyo Metro Tozai Line or Toei Oedo Line. 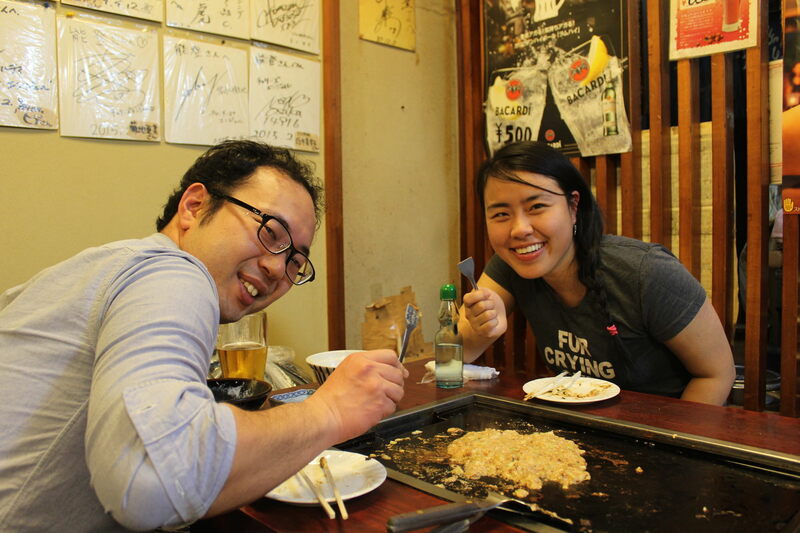 It was Jay’s first time and Sarah’s second time in Japan, and they had just arrived in Tokyo a few days ago. They told us about sake bar in New York. They said at a sake bar in New York, you can drink many kinds of labels already, but they wanted to try something else in Japan. 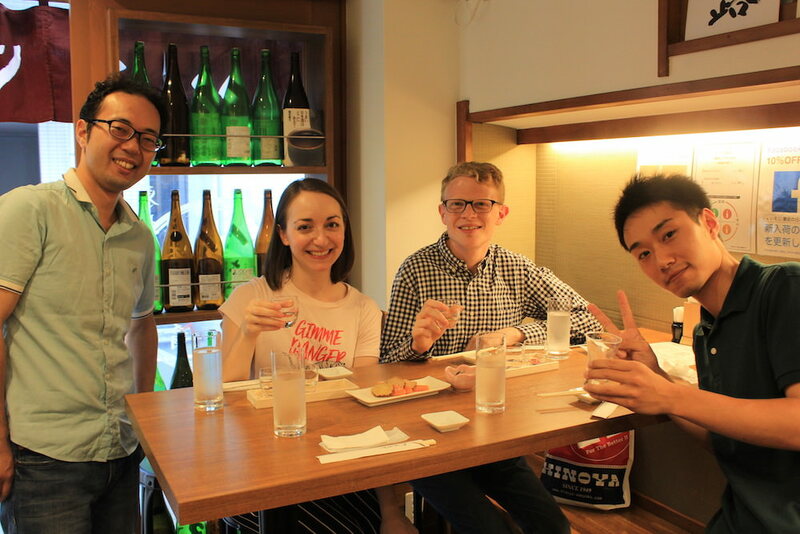 I was surprised to discover that you can enjoy such various sake in New York, too! The sake bar we visited is called “Ieji”. Ieji focuses on sake from Tohoku region, where is a great producer of rice and has the rich resource of pure, clean water. Therefore, many sake breweries and great tasting sake have developed in the area traditionally. Jay and Sarah first ordered “sake tasting set”. The set comes with three glasses, each different label, and different flavor. After the first “Kanpai”! Jay and Sarah ordered sake tasting set, and I had a small glass. As they taste different glasses, they discovered favorite one. When they tell the staff which glass you liked the most, the manager brings his recommendation. The manager is from Aomori Prefecture, which is one of the prefectures in Tohoku Region and has great knowledge about Japanese sake. 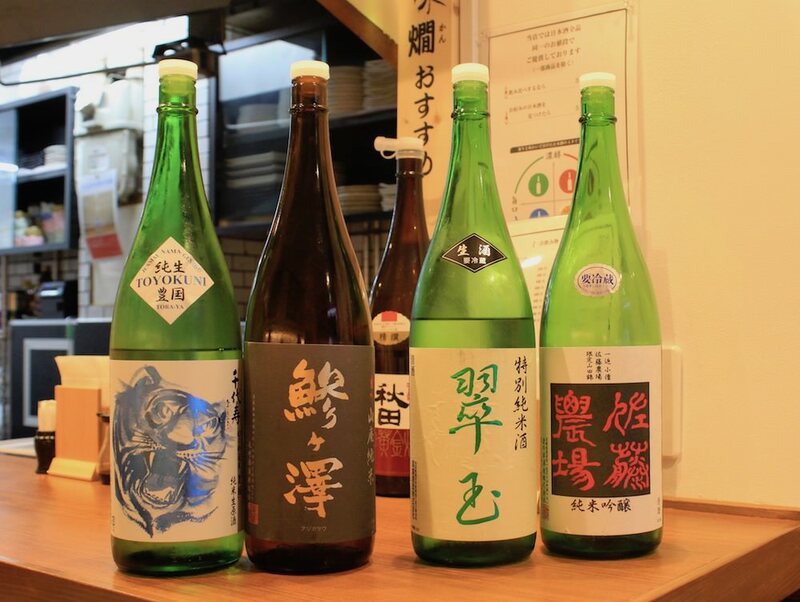 The sake bottles recommended by the manager. Most of them are “fresh (nama)” sake which means requires severe temperature management and rarely exported to abroad. As we are talking about bars in New York and how each spends Friday night outs, about each other’s work (we had similar jobs!) and apartments, etc., the staff Shu joined the conversation. 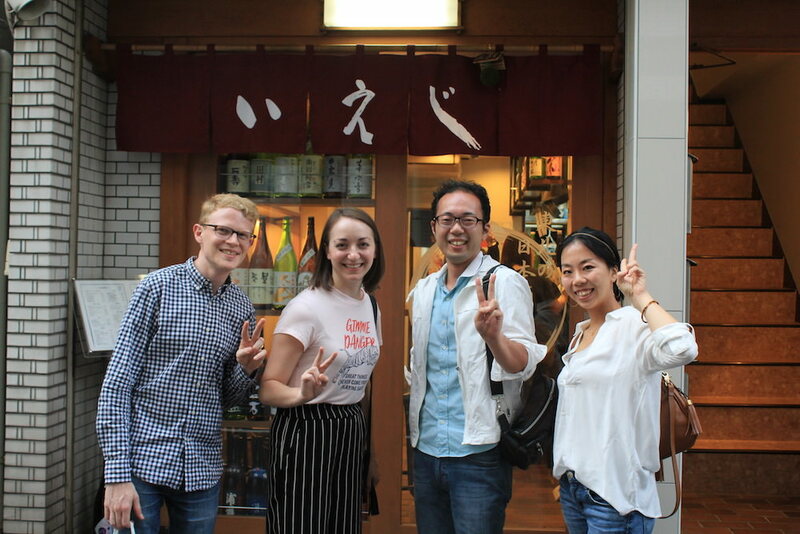 The staffs here are very friendly and interacting with staffs with deep knowledge about sake is also a fun part of this activity. The English speaking staff Shu on the right. We talked about many things, and time flies. We had to go and said goodbye to each other. We had a great time at the sake bar. Mari and Sosuke were so nice and easy to talk to and we had great conversations about NY and Japan. 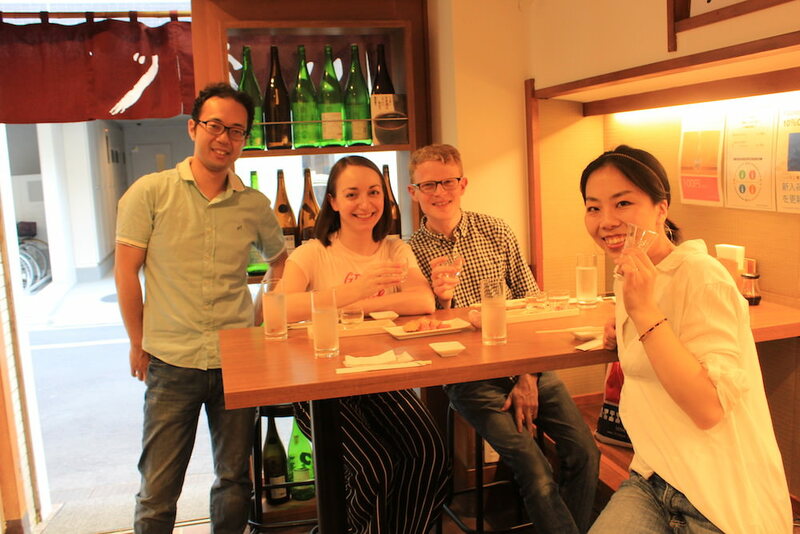 The bar was also really good with great sake and fun staff. Afterwards they showed us around the neighborhood and explained what all the different restaurants and bars were that we couldn’t read. Perfect experience with a local guide! Would definitely do it again next time we’re in Tokyo.